44 x 61 ½ inches. Established in 1991, Catharine Clark Gallery exhibits the work of contemporary artists. The gallery serves as the primary representative for a roster of 25 acclaimed artists including Sandow Birk, Masami Teraoka, Nina Katchadourian, and Stephanie Syjuco. Gallery artists have exhibited at international institutions such as the Tate Modern, the Museum of Modern Art and the Metropolitan Museum of Art. Paul Mullowney is the founder and director of Mullowney Printing in San Francisco. After becoming a Master Printer at Crown Point Press in San Francisco, Mullowney founded Tokugenji Press in Ouda, Japan, and later directed printmaking at Hui No’eau Visual Arts Center, Maui. Mullowney Printing is a multi-faceted studio publishing etching, woodcut, photogravure, direct gravure, screen-print, and letterpress editions by leading artists, including Allison Saar, Sandow Birk, and Don Ed Hardy. 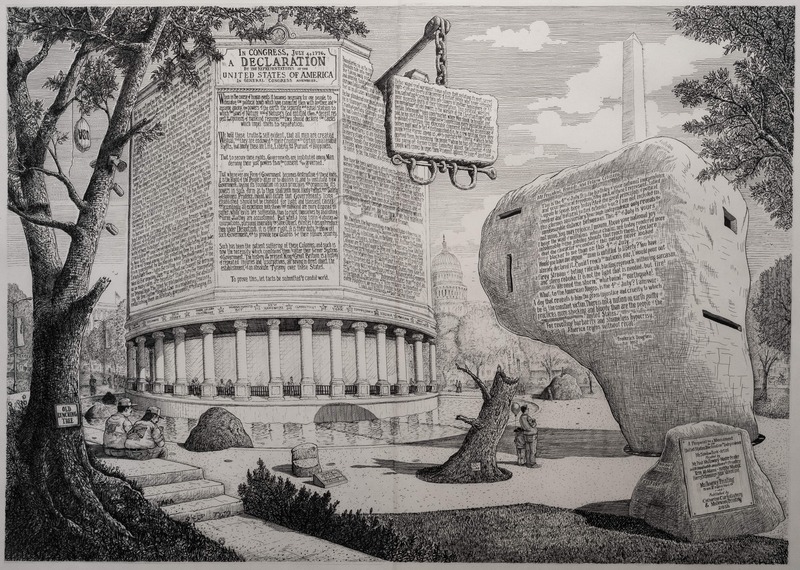 In 2010, Catharine Clark Gallery and Mullowney Printing co-published Sandow Birk’s Monument to the Constitution of the United States, a large-scale gravure etching from his “Imaginary Monuments” series. Since then, they have co-published multiple projects by gallery artists, including three additional direct gravure etchings from the “Imaginary Monuments” series, as well as the 38 1/2 foot monumental woodblock print, American Procession, by Sandow Birk and Elyse Pignolet.